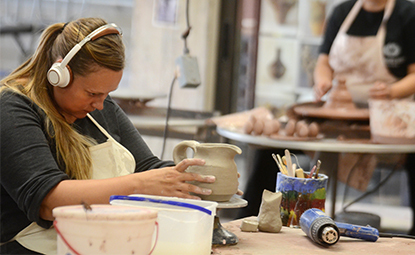 Students who choose an art major will work with artists who have national and international reputations in their field while they build their own strong foundation and general experience in the visual arts. Beyond the basics gained in lectures and discussions, you'll select studio courses such as printmaking, painting, sculpture, drawing, photography, video, painting, ceramics, installation and multimedia. Education Abroad opportunities will allow you to develop a global view of art. Visiting artists including Jesse Bransford and Nina Katchadourian and art professionals such as Eric Crosby, assistant curator of the Walker Art Center, help to round out your experience. Kiehle Visual Arts Center houses ceramics, wet-based photography and printmaking; large studio classrooms for painting, drawing, sculpture, and art education; student studios; a woodshop; a metal shop; and several large computer labs and a digital project lab that support graphic design, digital photography, video and multimedia. Faculty are established artists as well as teachers with work exhibited and selected for collections across the country including the Minneapolis Institute of Arts, Walker Art Center, Museum of Arts and Design in New York, Museum of Contemporary Photography in Chicago and Cain Schulte Gallery in San Francisco. Visiting Artists, Designers, and Curators Program annually invites three or four national arts professionals such as Nicholas Brown, a curator from Yale; Michelle Grabner, Chicago artist and co-curator of the 2014 Whitney Biennial; and Mark Randall, New York graphic designer to lead workshops and meet with students one-on-one to discuss their work. Student-run Gallery Vault in downtown St. Cloud provides exhibit space for student artists and develops art-centered events that connect the university and the St. Cloud community. Kiehle Gallery exhibits the work of innovative regional artists and designers who discuss their work during openings and hosts the annual juried student art show, curated by a Twin-Cities arts professional. 1 of 7 colleges, schools, and universities in Minnesota accredited by the National Association of Schools of Art and Design. Also accredited by National Council for Accreditation of Teacher Education (NCATE)/Council for the Accreditation of Educator Preparation (CAEP). Faculty includes two Fulbright fellows, five McKnight fellows, three Bush fellows and one Joan Mitchell Foundation fellow. Notable alumni: TyRuben Ellingson '81 '82 is a conceptual designer who has worked with film directors such as James Cameron, Steven Spielberg, George Lucas, Francis Ford Coppola, Guillermo Del Toro and the late Stanley Kubrick. Valerie Snobeck '03, named by arts writer Elisa Carmichael as one of 25 artists to watch in 2013, exhibited as part of Whitney Biennial, a show of new American art at Whitney Museum of American Art in New York City.